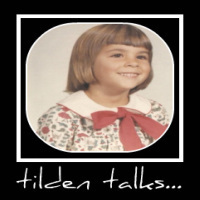 tilden talks...: Halloween Party Games at Your Fingertips! Earlier this week I downloaded party games! After I added some paper there was a whole bunch of Spooky Fun! Scavenger hunts, trivia games, pin the head on the monster and Halloween Charades were just a few of the great games included in the party pack. Python Printable Games supplied me with nearly 50 Halloween themed party games that are simple to download and print. Python also has camping games, Thanksgiving games and slumber party games. Also available are games for 30th, 40th and 50th birthdays! Shawn turned 30 this week so we are going to grab that party pack for his celebration this weekend. The games are available separately too, but you get the best deal when you choose a party pack priced at $19.99. Manda and I had such a blast asking each other trivia questions, we took some of the games and coloring pages over to Vanessa's place. Her girls had great fun doing one of the scavenger hunts and a "spot the difference" game. Both girls asked if we could bring more games to their Halloween party and share them with their guests. Check out Python Printable Games for your next party camping excursion or trivia night. The payment methods are secure, the downloads quick and easy and the party packs not only fun but an exceptional value! Downloading some now. The girls are going to love these! I thought these were great. I have a whole file full of games. If the church has a Halloween party these will come in handy!